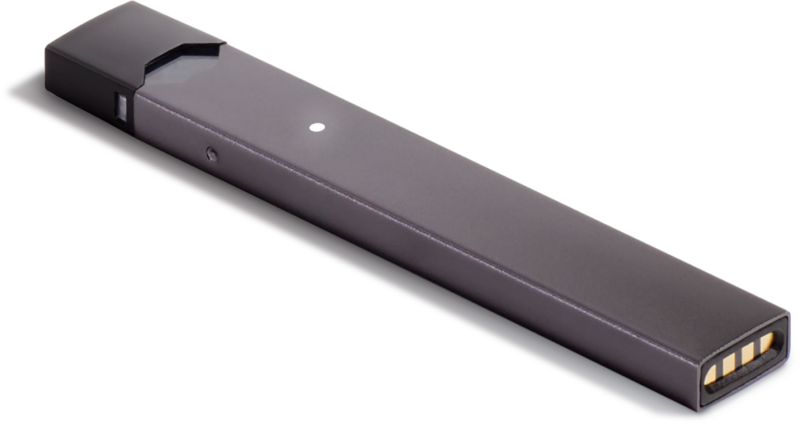 Simple and portable, The JUUL vaping device was designed with smokers in mind. Make the Switch to JUUL today and see for yourself. The JUUL pod starter kit is both a stylish and sleek pocket-sized vaping device. It aims to keep everything as easy-to-use and simple as possible. No buttons or switches featured on the device. It is as simple as popping an e-liquid filled pod in and start vaping. JUUL now available in the UK! Starting out with the vision of creating a satisfying alternative to cigarettes, JUUL has since taken the US by storm and now find themselves landing over here in the UK! The Starter Kit features four JUUL prefilled e-liquid pods, all of which come in 1.7% nicotine by weight (20mg of nicotine) and provides around 200 puffs per refill. With the flavours of these pods ranging from the likes of Golden Tobacco to Glacial Mint, there’s sure to be a flavour that’ll best suit your taste-buds! So, if you’re looking for a mouth to lung vape device that features a simple interface, thorough flavour variety and lack of lingering smell, JUUL stand head and shoulders above all else. ONLY AVAILABLE TO CUSTOMERS IN THE UK & IRELAND. ﻿Please note that we can no longer ship batteries or devices containing batteries outside of the United Kingdom via Royal Mail. When ordering to Republic of Ireland you must select Courier Express Delivery by DHL at the checkout when purchasing battery products to avoid delays and additional charges to your order. Limited to 2 batteries per order. Easy to use. No buttons or switches. Just insert the pod and start vaping. Experience freedom from ash and odour. No mess. No fuss. Designed with smokers in mind, from form to technology to flavour. JUUL Refill kit consists of 4 pods in a Glacier Mint flavour. The flavour consists of a crisp peppermint with a soothing aftertaste. JUUL Refill kit consists of 4 pods in a Golden Tobacco flavour. The flavour consists of a strong golden tobacco with aromatic notes. JUUL Refill kit consists of 4 pods in a Mango Nectar flavour. The flavour consists of a rich mango with hints of tropical fruits. JUUL Refill kit consists of 4 pods in a Royal Crème flavour. The flavour consists of notes of vanilla, silky custard and crème brûlée. JUUL Refill kit consists of 4 pods in a Apple Orchard flavour. The flavour consists of crisp green apples. JUUL started out with the vision of creating a satisfying vape alternative to cigarettes. The new vaping brand has taken the US by storm and now find themselves landing over here in the UK. Ecigwizard are an official JUUL partner, where you can buy all JUUL products. Click here for all JUUL products. The JUUL Starter Kit is both a stylish and sleek pocket-sized ecig pen device that aims to keep everything as minimalistic and simple as practically possible. We also stock all 4 flavours of JUUL Pods in 4 packs.